Liquid Notes for Ableton Live - Intelligent Songwriting. Liquid Notes for Live (Midi PlugIn) is a songwriting assistant tool for editing complex harmonic progressions. It offers a controllable range of alternatives for chords and harmonies in singletrack or multitrack MIDI arrangements and makes the theory of harmony fully accessible to you. A powerful harmonic analysis atomizes even complex multitrack songs and detects their various musical elements and their correlations. Musical adaptation (resynthesis) builds meaningful musical context from various input data (e.g. melodies, bass lines, chords, loops, rhythmic patterns etc.). conventionality of the chords in the harmonic context. This enables you to build up a MIDI arrangement in Live or to load an existing project, and to utilize the music intelligence of Liquid Notes to arrive at the sound and emotional message you are looking for. From variations of an entire song or just certain segments of it to spicing it up and making it sound different from others, Liquid Notes adds the intelligence to Live that helps you to apply such changes with a click of the mouse only. Any change to your arrangement is made in real time for all tracks, and is immediately audible for the user. 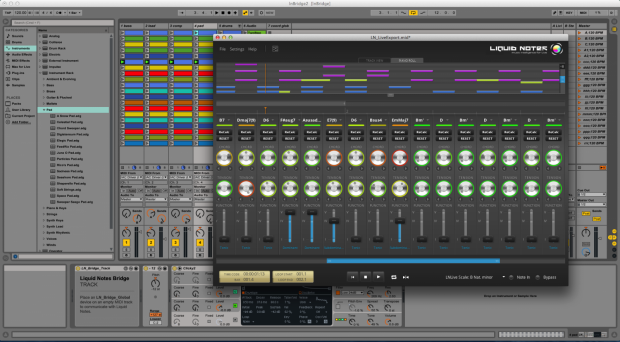 Liquid Notes uses the Max for Live standard in Ableton Live 9 to run as a MIDI effect. Any installed and activated version of Ableton Live 9 is required to use this software!